Why do rosacea symptoms and triggers progress over time typically? How can rosacea advance from mild rosacea to severe rosacea in just a couple months after a single trigger… or for no obvious reason at all? Do ‘rosacea genes’ govern our rosacea symptoms, triggers and degree of progression? More importantly, just how do you stop rosacea progression and reverse it back to its mildest form? Can we turn off the genes and cells responsible for progression? These are all questions being researched by a half dozen clinical labs across the United States and the focus of several superb National Rosacea Society Grants. This is currently the ‘hottest topic’ in rosacea because it holds the potential to put rosacea into remission or near-remission. So What Does Uncontrolled Blood Vessel Growth Have To Do With Rosacea? The most recent research study points to one primary molecule that is single-handedly to blame for most symptoms, triggers and may be the key to rosacea progression – the Vascular Endothelial Growth Factor (VEGF). VEGF is a potent dilator and the strongest stimuli for blood vessel growth (angiogenesis). No matter what the symptoms are, be it facial redness, flushing, blushing or acne rosacea, they all start from blood vessel dysfunction, dilation and vascular overgrowth. This affects every layer of facial skin and the heart of this vascular overgrowth is deep in the dermis and not visible to the naked eye… so, its importance until recently has been largely overlooked. This is our “Rosacea Iceberg” that dictates symptoms, triggers and progression strength. What is Angiogenesis: Basically it is the physiological process involving the growth of new blood vessels from pre-existing vessels. Specialists all agree that rosacea is a disorder of uncontrolled blood vessel growth in the facial skin. The extent of advancement is closely related to your genetic predisposition to vascular dysfunction. Some rosacea afflicted people have recessive genes (ie a moderate genetic predisposition); while some have ‘dominant rosacea genes’ (ie genetically more susceptible to progression and the advanced stages of rosacea). Note the two blood vessel loops and two vascular sprouts growing off the main red artery in the illustration above. This is angiogenesis. Within a few days there will be dozens of angiogenic vessels sprouting off this one primary vessel – resulting in increased redness, blood flow and inflammation. VEGF is the most important molecule in angiogenesis because it controls all four stages of blood vessel growth including the most important stage… the first stage of new blood vessel growth where cellular mitosis starts building a new vascular tube. In normal skin there is a balance between angiogenic factors such as VEGF and anti-angiogenic factors to be able to control blood vessel growth in the skin. Rosacea sufferers have much more VEGF in their facial skin resulting from over-expression of VEGF genes and a dysfunctional set of anti-angiogenic factors that are usually to blame for final off blood vessel growth – permitting this unchecked and unregulated allows blood vessel growth to be constant and pathogenic. This is the key to rosacea progression as one major trigger can set off days, weeks or months of uncontrolled blood vessel growth…. accompanied, by dilation, flushing and inflammation. That means that this is also one of the most important treatment targets to stop rosacea progression and treat the core of rosacea. Pharmaceutical companies concentrated on the treatment of Psoriasis are years ahead of Rosacea because they have multiple companies collaborating with each other. Based on their present rate of research and development, they should have treatments for uncontrolled blood vessel growth within three to four years… in oral and topical forms. They have been testing anti-VEGF antibodies that block this potent inflammatory dilator and angiogenesis stimulator with great success. In fact, patients with psoriasis receiving anti-VEGF treatment for cancer showed complete remission of their cutaneous symptoms during treatment that lasted for years after the last cancer treatment was completed [J Dermatol Sci. 2010 Jun;58(3):171-6. Epub 2010 Apr 9]. Several pharmaceutical companies also are testing topical treatments with anti-VEGF peptides and clinical results show remarkable inhibition of angiogenesis and substantial improvement in Psoriasis symptoms with safe topical treatment modalities [J Dermatol Sci. 2010 Mar;57(3):183-91. Epub 2010 Jan 8]. This is great news for rosacea sufferers as we shouldl be able to begin using these same therapy for our disorder. 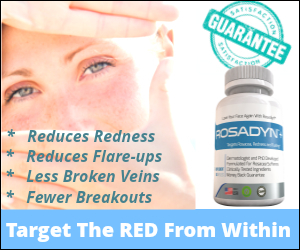 How does all this science relate to Rosadyn and targeting rosacea? Over the past five years it’s become evident that treatments for blood vessel pathophysiology is essential to rosacea treatment and stopping angiogenesis-induced progression. Below is an illustration of (1) normal skin with normal blood vessels, (2) rosacea skin with abnormal blood vessels (angiogenesis), and (3) Rosacea skin treated with oral Rosadyn showing normalization of blood vessel growth and inflammation (ie reversal of rosacea progression). Targeting angiogenesis and VEGF is probably the single best thing rosacea sufferers can do to clear superficial symptoms and treat the core inflammatory disorder from the inside out. Sulforaphane, the chemical extract abundant in the Brassica family of vegetables such as Broccoli Sprouts, Broccoli, and cabbage is one of the most intriguing Nutraceuticals of the decade. This extract is one of the most potent anti-inflammatories yet discovered and perhaps the single best supplement for all rosacea symptoms and triggers. With respect to VEGF, Sulforaphane’s main initial use was in the prevention and treatment of cancerous tumors. It completely blocked the formation of new blood vessels to the tumors, via VEGF inhibition, and in turn, the tumors shrank and died. The fascinating clinical findings demonstrated that Sulforaphane had the unique ability to block all four stages of angiogenesis…. To date, no prescription medication can block all four stages of blood vessel growth. In most cases it can block angiogenesis by 70% to 85%. While there are many Universities and Pharmaceutical Companies trying to unravel the mysteries of Sulforaphane, the John’s Hopkins School of Medicine is the leader in this field of study. Sulforaphane not only prevents angiogenesis in inflamed skin, but it binds onto old blood vessels, signals enzymes to cleave them into microparticles, and then delivers them to the lymphatic system where unhealthy blood vessels are disposed of. Pine bark extract is utilized for its vascular-specific actions especially pertaining to its active peptide fragments – oligomeric proanthodyn complexes [OPC]. Dozens of scientific and clinical studies have demonstrated that OPCs have a high affinity for blood vessel cells. OPCs physically insert themselves into the supporting matrix of the blood vessel wall, especially around endothelial cells, the primary cells that produce VEGF on the inside of the blood vessel wall. Our Eastern White Pine Bark Extract is a powerful angiogenesis inhibitor, especially in areas of active skin inflammation. Our Pine Bark OPC’s were also chosen because they act synergistically with sulforaphane in blocking production and activity of VEGF. We selected the newer Eastern White Pine Bark with 95% OPC’s because they are the most active substances in pine bark and directly impact the production and release of VEGF by binding to G-Proteins and suppressing the stimulus for VEGF production… even in severely inflamed rosacea skin. At clinical doses our select Pine Bark Extract can inhibit VEGF production by 25% to 40%. It’s germane to point out that almost all other pine bark extracts only contain 40% to 60% OPC concentration (nearly half our concentration) and at the clinical dose we use (200 mgs) are nearly as expensive as our entire Rosadyn Nutraceutical which has 12 other active clinical ingredients. Mediterranean skin is known for its health and beauty. Part of this is genetic, but recent studies have shown that a diet high in Mediterranean Olive Fruit Extract stimulates healthy skin cell production, supplies the proper precursors for tight, non-porous epidermal cells and protects the facial skin from environmental insults. Clinical studies have also demonstrated that Olive Fruit Extract is a potent anti-inflammatory because it blocks VEGF from binding to its receptors… this suppresses dilation, flushing, inflammation and the growth of new blood vessels. There are three main receptor subtypes for VEGF and Rosadyn’s Olive Fruit Extract is a strong blocker of Receptor Subtype-1 and -2 (the most important receptors). Pharmaceutical companies that specialize in developing pharmaceutical-grade nutraceuticals (e.g. medicinal supplements) have isolated two of the primary components in Mediterranean Olive Fruit Extract, Oleuropein (15%) and Verbascoside (5%) as well as important precursors that are responsible for blocking VEGF. Pharmaceutical Grade Mediterranean Olive Fruit Extract is truly one of skin’s best friends! The Chick Chorioallantoic Membrane (CAM) Assay: This is the ‘Gold Standard’ for evaluating a drug’s effectiveness on preventing angiogenesis. After stimulating angiogenesis in a clear, thin tissue layer, you can then compare disorders of angiogenesis and evaluate treatments that inhibit angiogenesis. This way you can find out how effective these treatments are with the CAM model… which mimics human skin responses. In the example below, angiogenesis was induced (Left photo) and grew for three days. Note the great number of feed vessels and and vascular loops that developed in such a short time. In this simulation, the CAM in the right photo was treated with the same angiogenesis stimulator, but a clinical dose of sulforaphane was added to the CAM model. As you can see sulforaphane blocked approximately 95% of blood vessel growth including near-complete inhibition of the large feed vessels and capillary loops showing the efficacy of Sulforaphane in the treatment of angiogenesis.